Thousands of Catalans are thronging the streets of Barcelona to mark their national day - the "Diada" - and show support for an independence referendum. Catalonia's pro-independence government plans to hold the referendum on 1 October, defying Spain which deems it illegal. Catalonia has passed a law to secede from Spain if the vote is Yes. The crowd in central Barcelona is expected to swell to as many as 500,000, as Catalans of all ages descend on the city. Nearly 2,000 buses were chartered to bring people to the rally. The crowd - many sporting T-shirts in the national colours - is to form a giant cross, the regional daily La Vanguardia reports. Last week Spain's Constitutional Court placed a legal block on the independence referendum. A majority of Catalans want the vote to go ahead, polls suggest, to settle the thorny issue of independence. Last edited by Anthea on Mon Feb 11, 2019 11:04 am, edited 24 times in total. Catalan separatists and supporters of the region's right to hold a referendum on independence from Spain have held a rally backing more than 700 mayors facing the threat of arrest. The mayors have been called in for questioning by prosecutors for agreeing to facilitate the vote locally. They could be arrested if they do not attend and prosecuted for using public funds if they help stage the ballot. Madrid has promised to block the vote, saying it is unconstitutional. 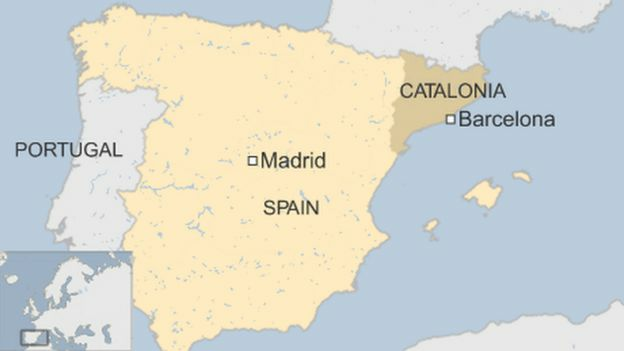 Catalonia's regional government insists it will take place as scheduled despite a growing clampdown by the Spanish state. 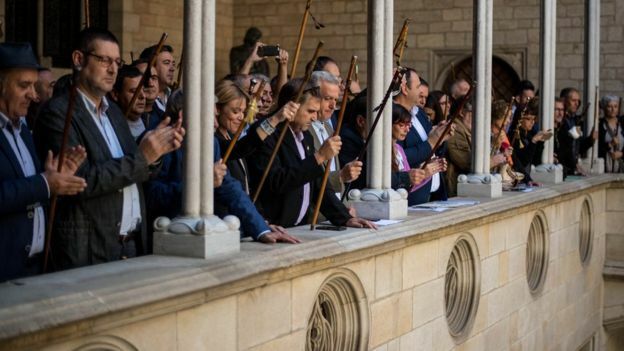 Some of the mayors gathered with Catalan President Carles Puigdemont outside the headquarters of the regional government, the Generalitat Palace, as supporters waved the lone-star flag of the independence movement. "We stand firm against threats, censorship and prosecution and repeat this: we want to be a free country," Mr Puigdemont told the crowd, according to a tweet by the Catalan National Assembly grassroots independence movement. Chants of "We will vote" could be heard from the crowd. 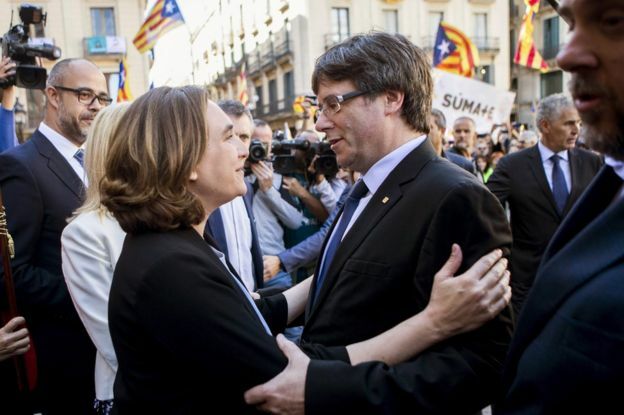 Barcelona Mayor Ada Colau, who supports the right to hold the referendum, also turned up. "It's a disgrace that we have a government that is incapable of dialogue and instead dedicates itself to pursuing and intimidating mayors and the media," she said. Ms Colau announced on Thursday that people in Barcelona would be able to vote without civil servants involved risking their jobs but did not explain how. On Friday, the Spanish government gave the regional government 48 hours to abandon its "illegal" referendum plans or lose budgetary powers. "If, 48 hours from now, there's no compromise that falls within the law, from then on the Spanish government will take over responsibility for making Catalonia's payments," Spanish Prime Minister Mariano Rajoy later told a meeting of his Popular Party in Barcelona. "My friends, I say this both calmly and firmly: there will be no referendum, it won't happen." Mr Rajoy also announced that police from Spain's national Guardia Civil force had seized 100,000 referendum posters. No government in the world, he said, could accept one of its regions unilaterally scrapping the nation's constitution and its laws. Attempts to block the official referendum website have continued. Thousands of ballot boxes are said to have been hidden by referendum supporters. Police have been hunting for them but Toni Castejon, spokesman for the Catalan police force, admitted "right now, we have no idea where they are", the Reuters news agency reported. Spain's Guardia Civil police have detained 14 Catalan officials and raided regional government ministries involved in organising a banned independence vote. Tensions were already high before Josep Maria Jové, number two in the Catalan vice-presidency, and others were held. Thousands of Catalans took to the streets in protest and the regional leader complained of a power grab. Spanish Prime Minister Mariano Rajoy said the state had been forced to act. Catalonia's separatist government is defying a Constitutional Court order to halt the planned 1 October vote, which has been condemned by the Madrid government as illegal. Wednesday's operation targeting over 20 ministries and institutions was a dramatic intensification of Spain's attempt to stop the vote taking place. At least six million ballot papers were found in a warehouse outside Barcelona, reports said. And in a separate move Spain's finance minister, Cristóbal Montoro, said the national government was now set to take control of a large part of Catalonia's public finances. After an emergency cabinet meeting Catalan President Carles Puigdemont accused the Madrid government of "de facto" suspending the region's autonomy and imposing a state of emergency. Why is Spain cracking down? Eleven days ahead of the planned vote on 1 October, the national government has made its biggest move yet to stop it happening. Spain did not stop an earlier vote taking place in November 2014, but this time the Catalan leadership plans a declaration of independence within 48 hours of a Yes vote. Spain's government has been backed by the Constitutional Court, which has suspended the referendum law passed by the Catalan parliament. Mr Rajoy said the regional government had been warned that they were destroying Spain's national sovereignty, "There's no democratic state in the world that would accept what these people are planning," he said. He urged the Catalan president to comply with the law and put his secessionist challenge into "reverse gear". Several ministries in Barcelona were raided on Wednesday, including the economy, foreign affairs, telecoms, social affairs and presidency buildings. Among those detained were officials from the economy ministry, run by Catalan Vice-President Oriol Junqueras, as well as figures from other departments. Police were searching for computer equipment and any documentation linked to the planned vote. The day before, they seized some 45,000 envelopes with the Catalan government's logo from a private delivery company in Terrassa, north-west of Barcelona. On Friday, the Spanish finance minister gave Oriol Junqueras a deadline to call off the vote or see funding for essential services in Catalonia taken over by Madrid. A letter was sent to Mr Junqueras late on Tuesday reminding him the deadline had passed. Spain is one of the countries which stand up strongly against Kurdish referendum, we can understand why. Catalonia's separatist government is adamant it will go ahead with Sunday's referendum despite the country's highest court barring it as unconstitutional. More than 5.3 million voters are on the electoral roll, according to the Catalan government. More than 160 schools in Catalonia have been occupied by activists trying to keep them open ahead of the region's banned independence referendum, Spain's central government says. Police visited 1,300 of the 2,315 schools in Catalonia designated as polling stations, finding 163 occupied. Tens of thousands of people are expected to attempt to vote on Sunday. As a result, Spanish authorities are now stepping up their attempts to stop the ballot taking place. Authorities in Madrid have sent thousands of police to the region to stop the referendum - declared illegal by Spain's constitutional court. They are being assisted by the Catalan regional police force, the Mossos d'Esquadra. Police have now occupied the regional government's telecommunications centre. Police have also been ordered to clear schools occupied by activists aiming to ensure the buildings can be used for voting. Many of those inside the schools are parents and their children, who remained in the buildings after the end of lessons on Friday. Some told Reuters news agency that police had told them they could stay as long as they were not doing anything connected to Sunda's vote. Laia, a 41-year-old sociologist who is staying in a Barcelona school this evening, said the police had visited four times. "They read us out the part of the court order that says no activities related to the preparation of the banned referendum are allowed," she told Reuters. What is the basis for the vote? Officers have been visiting the locations due to be used as polling stations, as well as seizing items such as ballot papers, while prosecutors have ordered the closure of websites linked to the vote and the arrest of officials organising the referendum. But Catalan leader Carles Puigdemont told Reuters that the referendum would go ahead. "Everything is prepared at the more than 2,000 voting points so they have ballot boxes and voting slips, and have everything people need to express their opinion," he said. Central government spokesman Iñigo Mendez de Vigo accused the Catalan government of being inflexible and one-sided but it is a charge Catalan nationalists throw back at Madrid itself. "I don't believe there will be anyone who will use violence or who will want to provoke violence that will tarnish the irreproachable image of the Catalan independence movement as pacifist," Mr Puigdemont said. Catalonia's independence referendum has begun in chaotic fashion, with police attempting to prevent the vote from taking place. The Spanish government has pledged to stop a poll that was declared illegal by the country's constitutional court. Police officers are blocking potential voters from entering polling stations, and are also seizing ballot papers and boxes. Nonetheless, Catalan government officials have predicted a big turnout. The ballot papers contain just one question: "Do you want Catalonia to become an independent state in the form of a republic?" There are two boxes: Yes or No. Ahead of the polls opening, the Catalan government said voters could use any polling station if their designated voting place was shut. 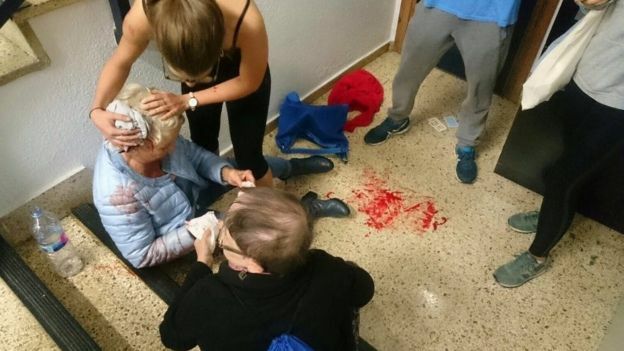 In the town of Girona, riot police smashed their way into a polling station where the region's leader Carles Puigdemont was due to vote. Television footage showed them breaking the glass of the sports centre's entrance door and forcibly removing those attempting to vote. However, Reuters news agency reports that Mr Puigdemont was still able to cast his ballot. Meanwhile, reports from the regional capital Barcelona say two people have been injured after police charged pro-independence demonstrators. Since Friday, thousands of separatist supporters had occupied schools and other buildings designated as polling stations in order to keep them open. In some areas, farmers positioned tractors on roads and in front of polling station doors, and school gates were taken away to make it harder for the authorities to seal buildings off. Referendum organisers have called for peaceful resistance to the police action. How did Madrid prepare for the vote? Thousands of extra police officers have been sent to the region, many of them based on two ships in the port of Barcelona. The Spanish government has put policing in Catalonia under central control and ordered the regional force, the Mossos d'Esquadra, to help enforce the ban on the illegal referendum. In a show of force ahead of the poll, Spanish authorities seized voting materials, imposed fines on top Catalan officials and temporarily detained dozens of politicians. Police have also occupied the regional government's telecommunications centre. Barcelona's mayor says at least 460 people have been injured as police have used force to try to prevent voting in Catalonia's independence referendum. Police officers are preventing some people from voting, and seizing ballot papers and boxes at polling stations. Updating the injury toll to 460, Barcelona's Mayor Ada Colau condemned police actions against what she said was the region's "defenceless" population. 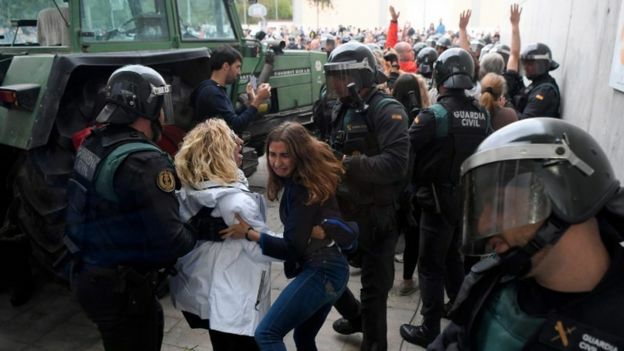 The national police and Guardia Civil - a paramilitary force charged with police duties - were sent into Catalonia in large numbers to prevent the vote from taking place. Catalan leader Carles Puigdemont said: "The unjustified use of violence... by the Spanish state will not stop the will of the Catalan people"
Spain's Deputy Prime Minister Soraya Saenz de Santamaria said police had "acted with professionalism and in a proportionate way"
The Guardia Civil said it was "resisting harassment and provocation" while carrying out its duties "in defence of the law"
One voter, Júlia Graell, told the BBC that "police started to kick people, young and old", adding: "Today, I have seen the worst actions that a government can do to the people of its own country." The BBC's Tom Burridge, in Barcelona, witnessed police being chased away from one polling booth after they had raided it. Meanwhile, FC Barcelona's match against Las Palmas was played behind closed doors, after Barcelona said the football league refused to suspend the game. Jordi Turull, the spokesman for the Catalonia regional government, said the Spanish government would end up responding to the international courts over the violence. He described the actions of the Spanish state as "the shame of Europe". The deadline for voting is 20:00 local time (18:00 GMT), but Mr Turull said that anyone in the queue at that time would be allowed to vote. He said he did not know when the vote count would be finalised. Spanish Prime Minister Mariano Rajoy says the vote goes against the constitution, which refers to "the indissoluble unity of the Spanish nation, the common and indivisible homeland of all Spaniards". The Spanish government has always said that it's the Spanish courts ordering the Spanish police to act. But their strategy today of physically preventing people from voting has the potential to backfire hugely. Had you asked me 24 hours ago whether or not I thought it realistic that Catalonia's regional government would declare independence from Spain in the next few days I would have said probably not. But after the very ugly scenes we've seen across this city and this region today I think it is a very real possibility. If that happens then we're into the unknown. The Mayor of the regional capital Barcelona Ada Colau issued a statement demanding “an immediate end to police charges against the defenceless population”. Madrid said its police had acted in a proportionate manner. Police broke down doors to force entry into voting stations as Catalans shouted “Out with the occupying forces!” and sang the anthem of the wealthy northeastern region. In one incident in Barcelona, police fired rubber bullets. “I‘m so pleased because despite all the hurdles they’ve put up, I’ve managed to vote,” said Teresa, a 72-year-old pensioner in Barcelona who had stood in line for six hours.